This was completely a fluke and un-choreographed and probably only really hilarious to us - but, thought I'd share it anway. There is no rational explanation for the human fascination with a cat sitting in a sink - nor is there for why, exactly, felines like to occupy usually water-filled basins...all I know is that it's a shared joy for observer and participant. 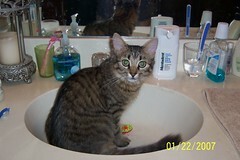 I've long been a fan of Cats in Sinks, but never even dared to hope that I'd get in on having my furry, loved ones posted on the hallowed basin-full-of-fur archives. Gia and JoJo, you see, were not interested in sinks. Not in any, way, shape or form - I'm not even sure they know what sinks are. My cats, thankfully, are not - and never have been - counter-jumpers. They don't get on our kitchen counters, and they would never even attempt to get on the bathroom counters. I never trained them this way; they just "came" like this...fresh out the box. Who was I to complain? I certainly wasn't about to train my cats to get on my counters simply to get a cat-in-sink shot. I'll admit, though, that I wasn't above trying to plop them in a dry sink and take a hasty snapshot. Since no camera has been designed to snap that "perfect" picture of a kitty seconds before they run off, none of these drop-attempts worked. Then along came our Maggie Fuu - Purveyor & Instigator of All Badness. Maggie has no problems being rude and knocking things off of your desk, walking across your keyboard, or jumping on the "off-limits" counters. She really doesn't give a toss about such kitty-etiquette. If it exists, Maggie must observe it, explore it, test it, and figure it completely out. Now if I could just get her off the counters.. I'm always half-heartedly poking around with genealogy and researching my own ancestry. I enjoy it, and I'm always interested in who my forebears were. Ancestry.com has a new feature, still in BETA, that allows you to see if you are related to anyone famous. Pretty neat, I think. I happen to be - so it would seem - related to some pretty cool people. Probably most interesting to me was the relation to Jack Kerouac; who I've long been a fan of. Apparently, Jack's 6th great-grandfather and my 9th great-grandfather were one in the same, a Noel Roy from Canada (1663-1731). That would make him my 7th cousin 3x's removed. We also share another relation: Edmee Lejeune; his 8th great-grandmother and my 10th great-grandmother (he's then, also, my 9th cousin 2x's removed) Pretty neat. I'd imagine, at some point, nearly everyone is related to nearly everyone else. There were more, but these interested me the most. This is as accurate as the data I've found so far - which (at where I'm at now) - checks out. I also did some more digging into my French heritage, and found I have some Creole as well as Cajun ancestors; my Cajun folk come from the Avoyelles Parish area and a goodly number of them were Creoles that came directly from France (not all, but some). Thanks to the Avoyelles Family Name Origins I now know where the Charrier, Guillory, Juneau, Roy, and Tassin lines in my family came from. Researching my family's past lines makes me realize so many things; things I wished I'd realized before my maternal (and Cajun-French line) all died out. We're all only about 3-4 generations from being forgotten. It was only in doing this research that I learned - seven years after her death - that my great-grandmother, Melina, was named for her own grandmother. She had never mentioned it to anyone and - had I not done a little looking - we never would have known. Does it even matter? I think so. Years after we are gone, unless we were famous, it will be only our descendants that will remember us, that will carry on the story of our lives, that will know or care that we ever even existed. Otherwise, we become only names and dates on a headstone or on faded, yellow papers stuffed away in some archive. I never met my ggg-grandmother, Melina; but I care that she lived and she is more than names and dates on the page to me. Though I know nothing about her, there are parts of her in my genes and in the lessons brought down and taught to me from her children, to my great-grandmother, to my grandmother, to my mother, and then to me. Whether I acknowledge her, and all of my other ancestors, or not - they are a part of me. They are the strands in the quilt that is me; without their existence, and their influence, I would not be alive nor who I am today. And, that, is why I care. Death to Spammers is my new refrain. In other news, I cannot *wait* for lunch time because Tweeze's birthday present finally came in last night; we're having lunch together and I finally get to give it to her!Â She will soon be the proud new owner of a Unazukin; and now I want one, too.Â She keeps a small, Magic 8 Ball in her purse and consults it when having trouble with decision-making.Â I think the Unazukin is a much hipper and nifty device for the job. The Worm ordered me flowers to be delivered to work for Valentine's Day; but they never showed.Â He was more upset than I was; he always gets me flowers, my sweetie.Â He ran off to Albertson's as soon as I got home and bought me a dozen, beautiful red roses and a big heart-shaped box of chocolate-covered nuts.Â I love that little guy. I know this is pretty random, but at least I'm writing. My two latest Internet obsessions are Find A Grave and Edit Red. One has become my newfound and beloved hobby, the other is kicking me in the arse and encouraging me to start writing again.Â I think both are good for me. My new hobby, as the FAGers term it, is "graving".Â I go through cemeteries, recording what I find and snapping pictures of headstones.Â For anyone who knows me and knows how much I LOVE cemeteries, this is a perfect hobby.Â It's also very helpful to others...for preserving history, finding lost loved ones, and genealogical research. I'm almost 30, the year I will start to become a serious writer (or so the voices told me when I was a kid), and Edit Red seems to be helping me in that direction.Â It's a community of writers who share their work & helpful critiques; and there are competitions to enter that get you published in anthologies.Â It's gotten me excited about writing again; a passion that definitely needed some reviving.Â For the first time in a long time, I want to write stories.Â So far everything is just possible pieces floating around in my head, but soon I hope to have something concrete to put down on paper. So, that's the update on me.Â I'm still here...lazy as ever about posting.